I went to see this twice when it was on . I think generally it was very good, but at the same time have needed quite a bit of time to let the ideas settle in my mind into some sort of writeable-about-thing. The exhibition was arranged according to the elapsed time since a wartime event took place, with the early rooms containing pictures that took place seconds or minutes after an action working up to the final rooms which were distanced from the action by a century or so. I suspect this applies not only to photography focused on war but to anything photographic that is dealing with the past. This entry was posted in Exhibitions & Books, The Art Of Photography and tagged exhibition, history, review, tate modern on June 16, 2015 by Simon Chirgwin. This entry was posted in Exhibitions & Books, The Art Of Photography and tagged Art of Photography, barbican, exhibition, thoughts on January 5, 2015 by Simon Chirgwin. 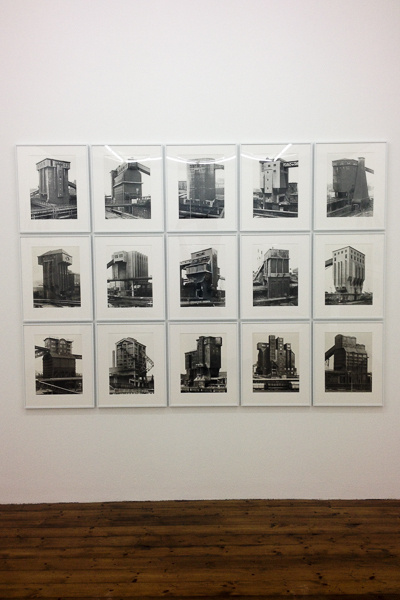 I caught the small exhibition (4 groups of 9 pictures ­ Cooling Towers, Water Towers, Gasometers and Commercial Facades ­ 1 of 15 pictures ­ Coal Bunkers ­ and some larger single images in a room off to one side) at the Spruth Mather gallery in Mayfair. It was good, free, but only ran until Saturday 4th October. Firstly, I marvelled at the ability of the eye to anthropomorphise – so many of the coal bunkers looked like insects or other small scuttley animals ­- but having got over that, I realised I was enjoying both the printing – so many different greys! ­- and how the way the Bechers used the tilt facility on the large format camera they used for their series to keep verticals vertical rendered everything slightly strange ­- verticals seen from below sometimes seems to converge at the bottom rather than in a “normal” vanishing point at the top ­- but in a much more subtle way than the perspective compensation stuff in Lightroom does. The flat white of the skies would have simply been blown highlights in digital colour, but here it ­- and the way the details in the background behind the industrial subject tends to overexposure ­- foregrounds the shape of the subject. Whether this was a result of the exposure on its own, good printing technique or a combination of the two, the effect was a good one, and one that it would be fun to play with. Individually some of the pictures were beautiful and -­ unlike much art photography -­ I’d happily hang them on the wall of my house; taken in their typed groups they were fascinating, illustrations of how you can build up series over time. 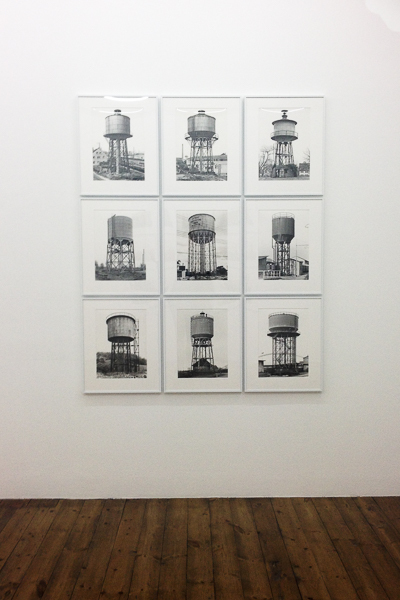 I think the ones I liked best were the ones that most chime with my experience ­- the gasometers and the water towers. Certainly there is stuff I can apply to pictures I make myself. The idea of taking similarly composed pictures of the same type of structure could easily be applied to the modernist coastal defences in Orkney; then there’s the German Atlantic Wall along the French coast; from behind, looking out to sea would be one angle, what would be the other? There are deflated gasometers all around me in the east end of London and to the east of Glasgow as you drive out on the M8 there are water towers, which look nothing like the “shuttlecock” water tower on the way in from Stansted. In the attic I have a Graflex Press Camera that I really should use to overcome my fears of bellows and recipricocity and tilts and shifts and have a proper play with. Maybe I could even start processing film again. Maybe I could work out how to get 5×4 sheets of colour slide film to a lab somewhere that will still do large format transparencies. I just need to find the time. 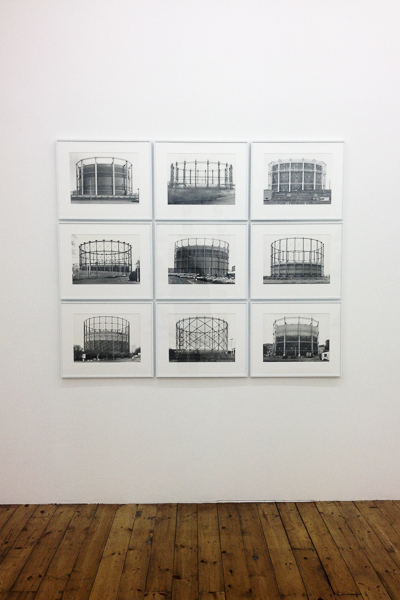 This entry was posted in Exhibitions & Books, Research and Reflection, The Art Of Photography and tagged becher, exhibition, gerd and hilla becher, london, new topographics on October 12, 2014 by Simon Chirgwin. This entry was posted in Exhibitions & Books, The Art Of Photography and tagged colours, exhibition, lines, malevich, painting, russia, shapes, suprematism, tate modern, ussr on September 10, 2014 by Simon Chirgwin. Last week I made my second and third visits to the Deutsche Börse Photography Prize showing at the Photographers’ Gallery. I was able to do multiple visits (my first had been the week before) because the gallery is about 10 minutes walk from my work, so a quick lunchtime visit is easily made. This is perfect when the exhibition is free and you can layer impression upon impression over the show’s run, which ended on Sunday. 4 artists were in contention for the prize, 2 on each of the top two floors the gallery. On the fifth floor were photos by Lorna Simpson and Richard Mosse; on the fourth, photos by Jochen Lempert and Alberto Garcia Alix. Photos taken using infrared stock (the effect of which can be seen on the header, on the left) of landscapes and people on the border between The Democratic Republic of Congo and Rwanda. Various groups have been fighting over this territory since the end of the Rwandan genocide, a brutal fact which contrasts strongly with the strange beauty of the large infrared prints where the green of foliage is shifted into a brilliant magenta and water and the sky are turquoise as lapis luzali. For me, the aestheticisation of the warzone certainly supplied a punctum to add distance between me and what was portrayed, the effect being to render the scenes strange and not of this world, creating a space where I could think about “war” and “africa”; but they also echoed psychedelic and prog rock album sleeves, which at least partially collapsed the political intent. That said, they were lovely to look at – and very large indeed – but I think the looking was primary, with the connotations of war – explicitly stated in the captions – coming a poor second, even in pictures of people in colour-shifted red-brown uniforms with guns; in some ways they seemed as created as last years’ fictional series telling the story of a 1960s Zambian space programme by Christina de Middel. But they were ravishing to look at. Like Chris Killip’s nominated work for last year’s prize, these pictures of Garcia Alix and his circle taken between the late 70s and a couple of years ago seemed quite old fashioned – black and white, documentary images shot over a period of time in a specific location. Also the subject matter – the photographer and his friends shoot up, get tattoos and get progressively more leathery and drawn over time – doesn’t seem particularly groundbreaking (I was thinking of Nan Goldin and Larry Clark as comparisons) but over the three lunchtimes – during which time I managed to see the whole of the 37 minute film that linked sequences of stills with ghostly black and white video footage of (I think) Beijing – I found I was more and more impressed by the way he seemed to view his move from handsome 22 year-old to Spanish-Keith-Richard-alike with distance and a lack of editing out the unpleasant. Also, like Simpson, he seemed to be dealing with poses from an earlier age – they were insider pictures of the other, but an other that was aware of its antecedents. Another example of photographs plus time equaling an increasing degree of meaning. Originally trained as a biologist, Lempert has been using photography since the early 1990s to study humans and the natural world. With an eye for subtle contrasts within subject matter – moss growing over a metal fence; a butterfly and its shadow on the grey concrete of the street – his use of repetition, pattern and abstraction creates connections between otherwise distinct subjects. His approach is scientific and poetic as well as humorous. More generally, it was interesting that everyone was using film, albeit in very different ways, making it quite a traditional set of nominees. All four in some way created some distance between subject matter and the pictures themselves (although, for me, Lempert created so much distance, I switched off). Mosse’s pictures won, but – aside for being glad that I saw them blown up to such huge proportions – I think I could have got the idea from reading about them; it was Garcia-Alix and Simpson’s pictures that I found myself going back to, analysing the performances, the distance between the old poses and the later recreations and enjoying the experience. Not sure how I would apply any of this to my work. But I’ll keep on thinking. This entry was posted in Exhibitions & Books, Research and Reflection, The Art Of Photography and tagged AoP, Art of Photography, criticism, deutsche börse photography prize 2014, exhibition, garcia-alix, lempert, london, mosse, photographers' gallery, simpson on June 30, 2014 by Simon Chirgwin.